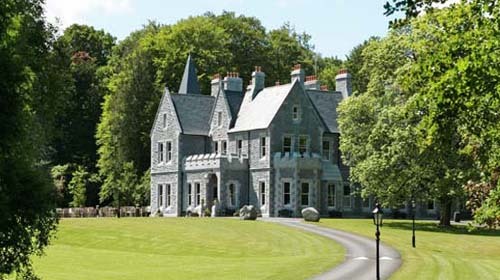 The Luxury 4 star Mount Falcon Country House Hotel in Mayo is located on the west bank of the River Moy, 100 acres of magical woodlands, between Foxford and Ballina, in North County Mayo, a most beautiful part of the West of Ireland. Mount Falcon’s new owners, amongst them the Maloney Family, who hail from the area, visited the Estate and fell in love with it. As the new owners, they have invested heavily in a refurbishment and development programme, and have at every stage ensured that the integrity and charm of the Estate has been completely retained. 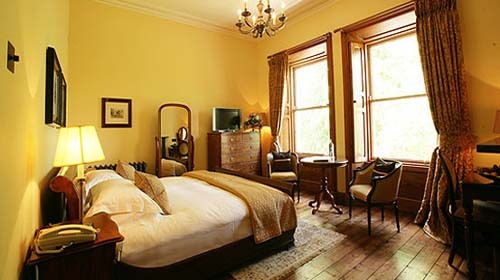 Mount Falcon Country House Hotel & Lodges is a deluxe, 4 star family-run Mayo Hotel, for the most discerning of guests. Golf, Angling, Deluxe Lodges and Spa Breaks are available throughout the year. The Woodlands, The Lakeside and The Courtyard are furnished and finished to a 4 star deluxe standard.
. Broadband wireless internet access available. 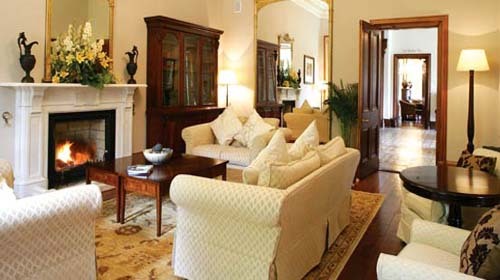 Book this luxury hotel accommodation in Ireland today and you won’t be disappointed. 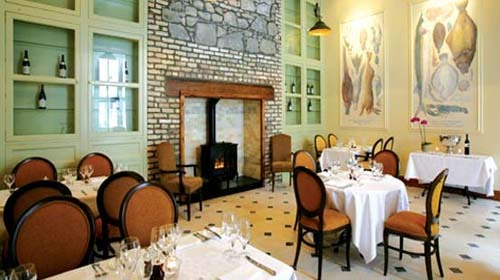 The Kitchen Restaurant in Ballina, as its name suggests, is located where the original kitchen in the house used to be. Following the tradition of the world-renowned Mount Falcon Fishing & Country Estate, run by the legendary Connie Aldridge, founder of the Blue Book, our diners will be offered a menu featuring the very best in quality, fresh, local organic produce perfect for eating out in Mayo. In 2008 Mount Falcon Hotel in Mayo became a member of Good Food Ireland, which is an organisation where all members are committed to using Irish, local and artisan food produce. This Mayo Restaurant is located on the ground floor, easily accessed from the main hotel foyer. The total seating area can accommodate 72 diners, with tables nestled around the original nooks and crannies of the original restaurant and pantry. Head Chef At Mount Falcon Luxury Hotel Mayo; Philippe Farineau. After many years of working in Ireland in some of the most prestigious Hotels e.g Hayfield Manor, where Philippe was awarded 2 Rosettes for the restaurant, he was also the overall winner of The Barry’s Irish Afternoon Tea Award. During his time at Hayfield the hotel won AA Hotel of the year. Philippe Farineau ” Irish Product, French Heart”. Tries to use as much as possible of local organic produce e.g vegetables, fruit and salad. The Moy River which runs through the Estate is a source of Wild Atlantic Salmon,Trout & Eel. Wild game will also feature on the menu in the coming winter months. All our own meat and poultry will be of Irish Origin and our cheese is sourced from Connaght and Munster. At Mount Falcon we offer a Table d’Hote Menu from Sunday to Thursday and “A La Carte Menu” each evening, we also offer a menu for vegetarians, vegans and cater for special dietary requirements. The restaurant caters for small groups & private parties, whatever the occasion; the service team will ensure that every element of your dining experience will be memorable. Unwind and relax and leave your thoughts behind you as you escape to Mount Falcon’s Spa. The Elemis Spa at Mount Falcon is the centre piece for relaxation and rejuvenation. This unique spa experience, deals with both the physical requirements by applying specialised treatments as well as healing the mind by creating a quite, warm and relaxing environment. This journey leaves guests totally pampered, soothed and relaxed. Elemis spa therapies work in natural synergy with the skin, body and mind. Every treatment is specifically designed to offer a unique experience, using powerful massage sequences and the most potent actives available in the world today. Elemis Spa Mount Falcon, an ideal location for your spa break in west of Ireland. The Mount Falcon “Castle” was originally created from the love of one young man, Ultred Knox, for his bride, whom he thought was so special that she deserved to live in a “castle”. Originating from this demonstration of absolute love, the Mount Falcon Estate is the perfect place for couples to celebrate their very special day, proving to be a much sought after wedding venue in Ireland. You don’t have to be from Mayo to have your Wedding in Mayo! Many couples are now looking for a venue for their wedding day that is a bit special. We recommend you visit the hotel and see it for yourself. We like to meet couples, talk to them, and take on board their requirements to ensure that their wedding celebration is unique and meets all their personal needs and expectations. Why not hold your conference in this beautiful setting in the West of Ireland! This conference hotel in Mayo offers high tech conference facilities for our corporate guests. The Fuller Suite can accommodate up to 120 guests classroom style / 200 theatre, with inbuilt AV equipment. The Knox Suite can accommodate up to 36 guests classroom style / 60 theatre style, an ideal breakout room with natural daylight. The Aldridge Suite can accommodate up to 36 guests classroom style / 60 people theatre style, with inbuilt AV equipment. The Boardroom can accommodate up to 12 people boardroom style, with inbuilt AV equipment. This room can also be used as a relaxing area for informal time outs. Telephone, broadband, wiffi access and enhanced cellular reception throughout the hotel. The hotel is an ideal venue for corporate clients, who want to follow a working event with the opportunity to break away and get involved in some country pursuits : e.g. fishing on site, other possibilities include : golf ( Enniscrone, Carne Belmullet, Rosses Point & Ballina Golf Club), archery,clay pigeon and horse riding subject to availability. We have a range of Day and Overnight delegate packages available, we would be delighted to work with you and devise a tailored package for your company and executives. The Mount Falcon Country House Hotel & Estate is one of the leading hotels in Ballina Mayo, located on the west bank of the River Moy, between Foxford and Ballina, in County Mayo, a most beautiful part of the West of Ireland. Daily scheduled flights from the UK into Ireland West Airport Knock - a 30 minute drive away. Scheduled flights from Dublin ( Aer Arann ) into Ireland West Airport Knock - a 30 minute drive away. Daily scheduled flights from the UK to Galway Airport - a 1.5hrs drive away. Daily scheduled flights from the UK to Sligo Airport - a 1hr drive away. Regular train services into Ballina Station. Take Dublin to Westport train and change at Manulla Junction.